Slighly larger than pest mites or approximately 1/16th of an inch. 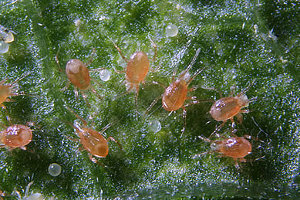 A. C. mites are no bigger, and sometimes smaller than the spider mites they control. Feeding on spider and willamette mites, they eat about five mites or 20 of their eggs per day. This is a hardy predator that can survive for a number of weeks without feeding, and can even prey on alternative food sources in the absence of Red Spider mites. They may feed on pollen or nector but will not harm plants, nor will they bite people. This predator is often used in green houses, on interior plants and outside ornamentals. They are effective on temperatures up to 85 degrees. It also tolerates a wide range of pesticides.